Effipro Duo Spot-On Solution for Small Dogs is indicated for the treatment of flea infestations alone or in association with ticks on Dogs weighing between 2 - 10kg. The topical solution treats and prevents flea infestations and remains effective for up to 7 weeks. 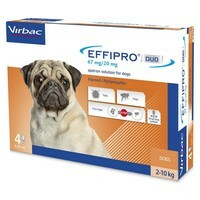 It will also inhibit flea egg growth into adult fleas for up to 12 weeks after treatment. Against ticks, the colourless solution will kill ticks and provide continuous acaricidal efficacy for 2 weeks against Ixodes ricinus, and for 4 weeks against Dermacentor reticulatus and Rhipicephalus sanguineus. Each 0.67ml pipette contains Fipronil 67mg and Pyriproxyfen 20.1mg.